High-altitude winds on neighboring Venus have long been known to be quite speedy, whipping sulfuric-acid-laden clouds around the superheated planet at speeds well over 300 km/h (180 mph). And after over six years collecting data from orbit, ESA’s Venus Express has found that the winds there are steadily getting faster… and scientists really don’t know why. By tracking the movements of distinct features in Venus’ cloud tops at an altitude of 70 km (43 miles) over a period of six years — which is 10 of Venus’ years — scientists have been able to monitor patterns in long-term global wind speeds. What two separate studies have found is a rising trend in high-altitude wind speeds in a broad swath south of Venus’ equator, from around 300 km/h when Venus Express first entered orbit in 2006 to 400 km/h (250 mph) in 2012. That’s nearly double the wind speeds found in a category 4 hurricane here on Earth! “This is an enormous increase in the already high wind speeds known in the atmosphere. 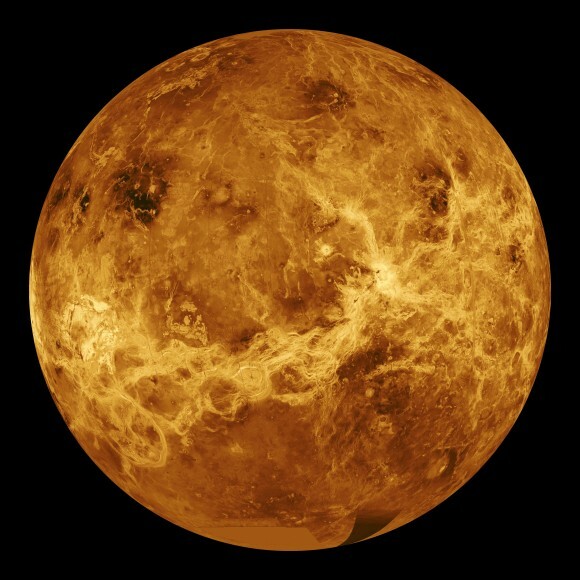 Such a large variation has never before been observed on Venus, and we do not yet understand why this occurred,” said Igor Khatuntsev from the Space Research Institute in Moscow and lead author of a paper to be published in the journal Icarus. A complementary Japanese-led study used a different tracking method to determine cloud motions, which arrived at similar results… as well as found other wind variations at lower altitudes in Venus’ southern hemisphere. A day on Venus is longer than its year, as the planet takes 243 Earth days to complete a single rotation on its axis. Its atmosphere spins around it much more quickly than its surface rotates — a curious feature known as super-rotation. Read more here on ESA’s Venus Express page.